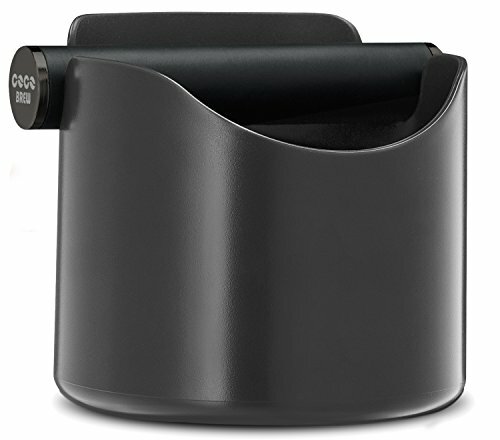 The CoCo Brew Espresso knock box is one essential accessory for home baristas to help dispose of your espresso pucks. The CoCo Brew Espresso knock box was designed to fit underneath most common espresso machines and big enough that you don't have to empty it too often. ✅PERFECT SIZE - The 4.7inch size is perfect for storing underneath most common espresso machine brands like Breville, DeLonghi, and more. The capacity is large enough that you don't have to empty it too often. ✅ANTIBACTERIAL - Manufactured out of a special antibacterial plastic to prevent bacterial growth. ✅DETACHABLE KNOCK BAR - The steel bar is made from high-quality steel and wrapped with a special foam that will absorb most of the shock. ✅SLIP RESISTANT - Rubber grip on the bottom of the coffee knock box will keep it from shifting during use. ✅SATISFACTION GUARANTEED - We're not happy until you are! For any defects in the materials or craftsmanship, please contact us and we will be glad to assist you. ➥To empty just lift the bar out and discard the coffee as you wish. ➥To wash the knock bar, we recommend rinsing in mild detergent. The plastic body is dishwasher safe so feel free placing it in the dishwasher. ✅ PERFECT SIZE - The 4.7inch size is perfect for storing underneath most common espresso machine brands like Breville, DeLonghi, and more. The capacity is large enough that you don't have to empty the grinds it too often. ✅ ANTIBACTERIAL - Manufactured out of a special antibacterial plastic to prevent bacterial growth. ✅ DETACHABLE KNOCK BAR - The steel bar is made from high-quality steel and wrapped with a special foam that will absorb most of the shock. ✅ SLIP RESISTANT - Rubber grip on the bottom of the coffee knock box will keep it from shifting during use. ✅ SATISFACTION GUARANTEED - We're not happy until you are! For any defects in the materials or craftsmanship, please contact us and we will be glad to assist you. If you have any questions about this product by Coco Brew, contact us by completing and submitting the form below. If you are looking for a specif part number, please include it with your message.